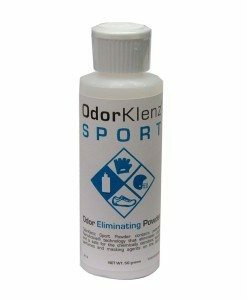 Smelly Shoes can become an embarrassing problem and your shoes can harbor noxious sweat and foot odors that can lead to some potential health concerns.OdorKlenz Sports powder was made with the athlete in mind to deodorize shoes and remove the toughest foot odors safely & effectively. Just apply a visible coating inside of the shoe and the sports powder will begin to remove bad foot odor that has accumulated in the inside of the shoe.The OdorKlenz Sports Powder will remain inside the shoe weeks after it has been applied and continue to get rid of shoe odors as they are introduced to the shoe. 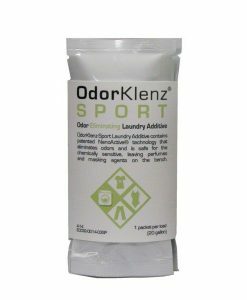 OdorKlenz Sports Powder can be used to remove offending sweat and body odors from your gear and fitness pads as well. 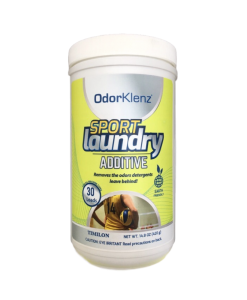 Often sports pads, gloves, and bags cannot be washed the conventional way but with OdorKlenz Sports powder you are able to apply it directly to your athletic items and remove the odors safely and effectively. 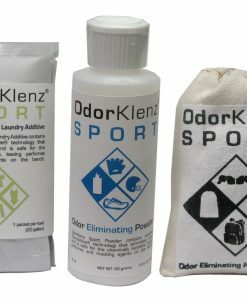 Another use for OdorKlenz Sports powder can be used to remove fragrances or perfumes that were transferred over to your shoes, gear, or equipment. 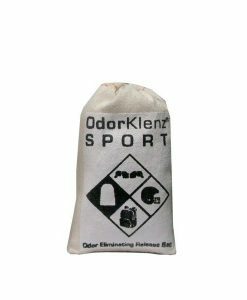 Just apply a visible coating and it leaves your items smelling clean and odor free.For more information on how to remove odors from gym bags and locker visit our OdorKlenz Sports Release bag page. As athletes, we know you pride yourself on the care and maintenance of your sports equipment. Lacing up your shoes, perhaps the two pieces of sports equipment that receive the most use, you may notice some scratches, scuffs, or maybe even some turf stains. What you notice, however, is not what you see; it’s what you smell. It’s that odor that offends your senses each time you go to lace up. It’s that the smell that overpowers everything in sports bags and lockers. The smell that won’t go away after smothering them in baking soda, and even after running your shoes through the washing machine. That smell. The pungent stinky, sweaty foot smell. It happens to all shoes, whatever sport they are for. Even after just one practice, that new shoe smell is gone and is replaced with stink. OdorKlenz has the solution to the stinky shoe issue. We have an innovative product that is formulated and targeted just for deodorizing and removing shoe odor. Without the use of toxic chemicals and perfumes. There is no need to spray your shoes in an over-perfumed mist while you hold your breath, use this natural and effective shoe deodorizer. Equipped with a convenient flip-top dispenser, OdorKlenz Sports Powder is ideal for easy, quick application. The quick-drying formula will make sweaty sneakers a thing of the past. No need to go out and spend a fortune on new shoes or athletic equipment. Our patented formula is safe and chemical free, leaving no heavily perfumed odor behind. The application is easy and quick: simply coat shoes or any sports equipment that has absorbed bacteria and sweat, with a visible coat of OdorKlenz Sports Powder. 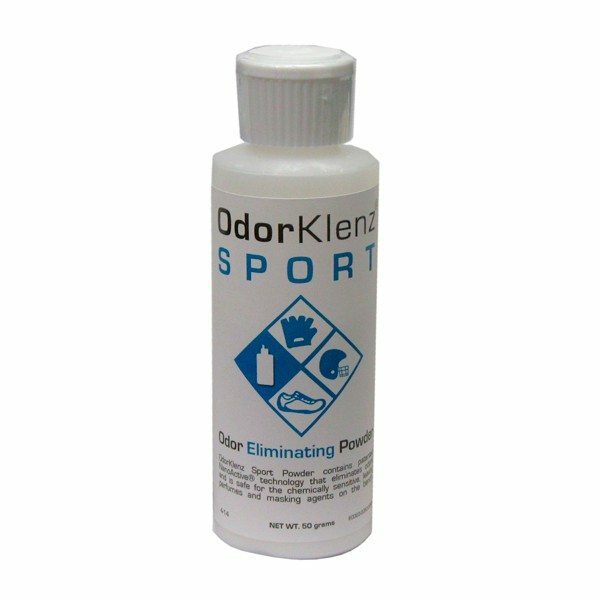 Click here to learn how to use the OdorKlenz Sports Powder. OMG! These are 3 words I use rarely. I live in Australia and this product is not available here so I purchase online from the states… I have tried many products for my daughters dance shoes but they don’t last long. OdorKlenz powder lasts and lasts. I cannot speak highly enough of their products. It works on my rock climbing shoes and that says it all! I used the OdorKlenz sport powder in just one of my daughter’s cleats and left the other cleat as-is overnight. The next morning, the difference was incredible. The odor in the treated shoe was gone, and the untreated shoe was a great reminder of exactly how strong the odor had been. I’m extremely pleased with the product. It worked perfectly. From a very happy customer who was very hesitant to buy it because I didn’t think it would work. Thank you! This powder has completely gotten rid of the terrible smell from my shoes. This stuff is awesome! Love this product we used it on our 13-year-old son’s hockey gloves and it works great! !